Muthuswamy, R., R, S. (2013). Anti-inflammatory Activity of Essential Oil of Canarium Strictum Roxb. Iranian Journal of Pharmaceutical Sciences, 9(2), 13-21. Ragunathan Muthuswamy; Senthamarai R. "Anti-inflammatory Activity of Essential Oil of Canarium Strictum Roxb". 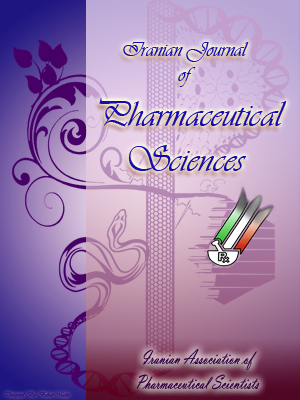 Iranian Journal of Pharmaceutical Sciences, 9, 2, 2013, 13-21. Muthuswamy, R., R, S. (2013). 'Anti-inflammatory Activity of Essential Oil of Canarium Strictum Roxb', Iranian Journal of Pharmaceutical Sciences, 9(2), pp. 13-21. Muthuswamy, R., R, S. Anti-inflammatory Activity of Essential Oil of Canarium Strictum Roxb. Iranian Journal of Pharmaceutical Sciences, 2013; 9(2): 13-21. Canarium L. is used in folk medicine as anti-inflammatory, antibacterial, antifungal, antitumor, heptoprotective, antioxidant, and anti diabetic properties. The present study investigeated the invivo anti-inflammatory activity of essential oil obtained by hydrodistillation of resin of Canarium strictum Roxb. In the current study, anti-inflammatory activity of essential oil of Canarium strictum Roxb (10-100 mg/kg) has been established by using the carrageenan (acute inflammation model) and formalin (chronic inflammation model) induced paw edema in mice. The dose dependent activity has been observed, the higher dose 100 mg /kg (p<0.01) exhibited momentous anti-inflammatory activity that was compared with standard drug diclofenac sodium in both acute and chronic inflammatory animal models. The perceived anti-inflammatory activity might be due to inhibition of histamine, serotonin, kinins, substance P, prostaglandins, and bradykinin at the inflammed area. More elaborate investigation is needed to correlate the possible effect of major terpenes on inflammation. Our data recommend that EOCS inhibits the paw edema and granulation tissue in experimental animal models of chronic inflammation, and acute inflammation would be a probable choice for treatment of chronic and acute inflammatory disorders.